And this raises questions about how our attitudes to our closest relations in the natural world have changed. Some people who contacted me volunteered to adopt Nemley Jr, the infant rescued from traffickers after the BBC investigation. Many expressed outrage at the wealthy buyers in China, South East Asia and the Gulf states whose demand encourages poachers to go on raids in the jungles. There has also been a new burst of fury at celebrities posing with chimps. Michael Jackson famously kept one called Bubbles. Paris Hilton drew criticism for kissing a baby chimp. More recently, Louis Tomlinson, of One Direction, was criticised for using one in a video. And a small number on Twitter and Facebook were so disturbed by the heart-breaking scenes in our videos that they wanted to see anyone trading endangered animals immediately locked up or even killed. What this represents is the latest episode in a long and often shameful relationship between chimps and humans. Strange though it seems, Neil Armstrong and Buzz Aldrin were able to become the first humans to walk on the Moon because of a legacy of rocket development that depended on chimpanzees. As it happens, the BBC's coverage of chimp trafficking aired on the very anniversary of the launch of Ham the Astrochimp, the first primate to reach orbit, back in January 1961. He had been captured in the jungles of Cameroon, strapped into a Mercury rocket and blasted into an unknown still deemed too risky for people. He survived, but other space-faring chimps had a far tougher time. 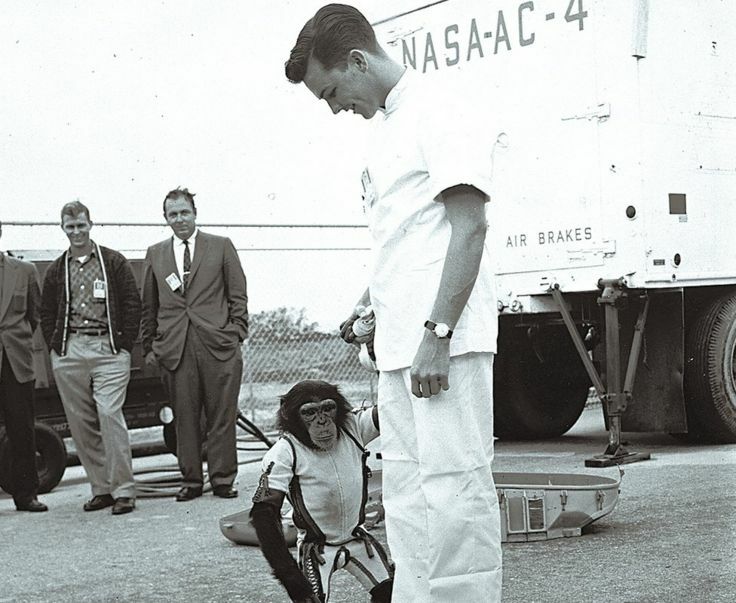 Enos, the second Nasa chimp sent into space, was given tasks to perform - and, if he got them wrong, his feet would be given a small electric shock. But the equipment malfunctioned, according to the account that emerged years later. So even when Enos performed properly, by pulling the correct levers when prompted, he was still electrocuted 33 times in all. None of this killed him, but his space capsule then landed off course. The truth was, chimps were deemed bright enough to stand in for people but were seen as expendable. Medical researchers also used to turn to chimps and other great apes to seek answers to fundamental questions about physiology and the brain. That work stopped in the UK many decades ago, and in several European countries more recently, but was phased out in the US only after a major scientific report in 2011 concluded there was no benefit from it. 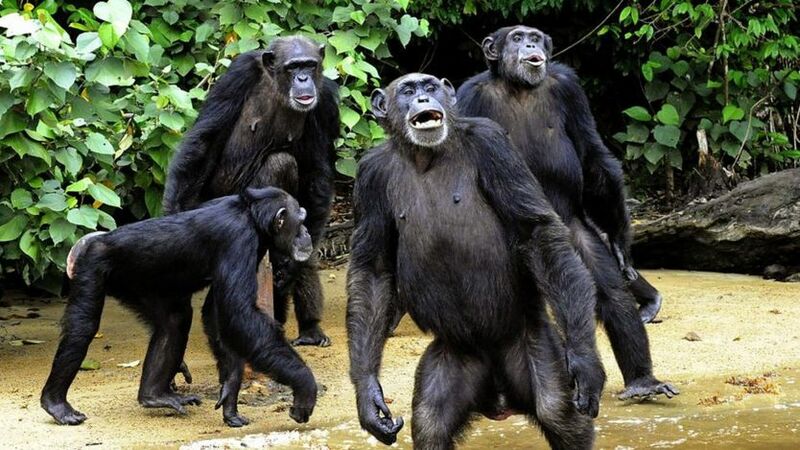 According to Sir Colin Blakemore, professor of neuroscience and philosophy at the University of London and a long-time defender of the use of animals in research, discoveries in the 1950s and 60s revealed how chimp brains were "uncannily" like ours. "The structures, the folds, the similarity was amazing," he says. The more the brains of chimps and other great apes were seen to be like ours, the harder it became to justify conducting experiments on them, and a ban became the inevitable outcome. And he highlights the work on HIV - carried out under massive public pressure at the start of the Aids epidemic - as an example of an apocalyptic scenario that might conceivably justify the use of great apes in the years ahead. "One could imagine that if the future of mankind is threatened by some terrible pathogen, then work on great apes might offer the possibility of saving the human race," he says. Another long-standing - and popular - use of chimps has been for entertainment. During our investigation, we heard of baby chimps performing in zoos in China. That sounds outrageous to us now, but the same happened for decades in the UK. 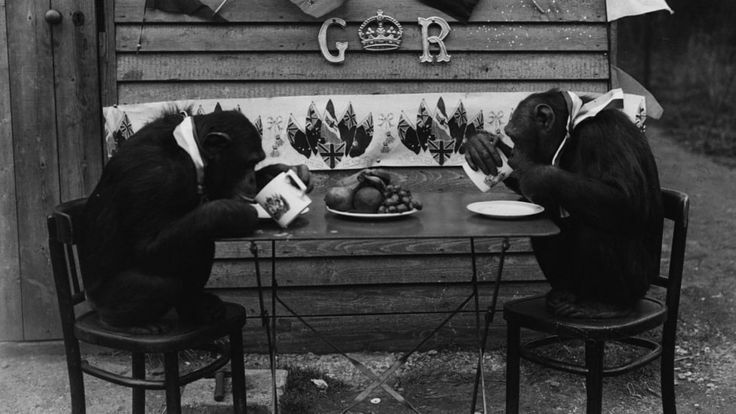 Chimpanzee tea parties were a big attraction - and they were only phased out at Twycross Zoo in the 1970s. The zoo's chimps became famous for appearing in hugely popular TV commercials for the tea brand PG Tips. The last of the animals to feature on air, a female known as Choppers, died last year. Sharon Redrobe, the zoo's chief executive, says a change in attitudes came as zoos faced having to cope with older chimps disturbed by their experiences and as conservation became more of a priority. "There's been a massive sea-change in the zoo community," she says. "In the 80s, there was a wake-up call that we needed to be part of the solution not the problem." 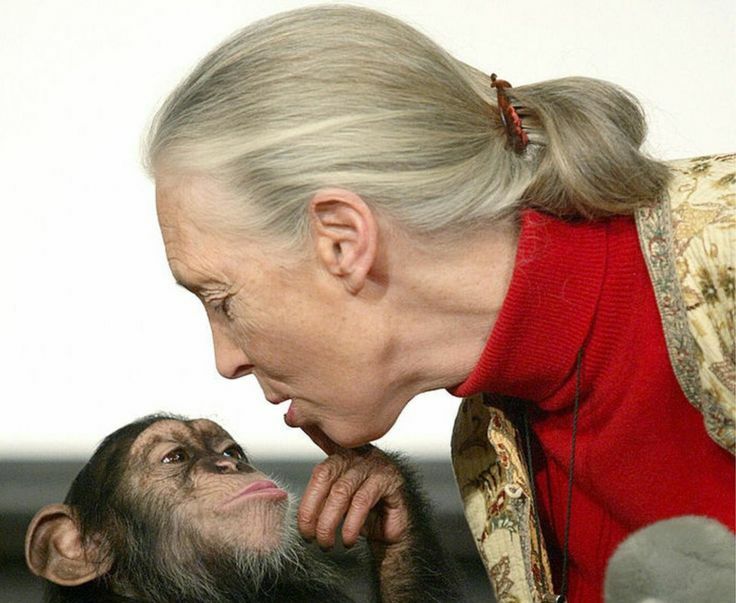 And, looking ahead, she says, celebrities "need to get the message that chimps don't make pets and that hugging them does them real harm". For Will Travers, president of the Born Free Foundation, it was the growing scientific understanding of chimps - through the work of Jane Goodall and others - that turned opinion against exploiting the animals, and he gives a poignant example. "There had been a misunderstanding that grimaces were smiles, but they were not," he says. "We now know they represented fear. Enjoyment is the lips pressed together. This was a turning point. "We've shot them into space, used them in experiments, dressed them up and pretended they're little humans, but the one thing we haven't done is the one thing they need: protection from us." 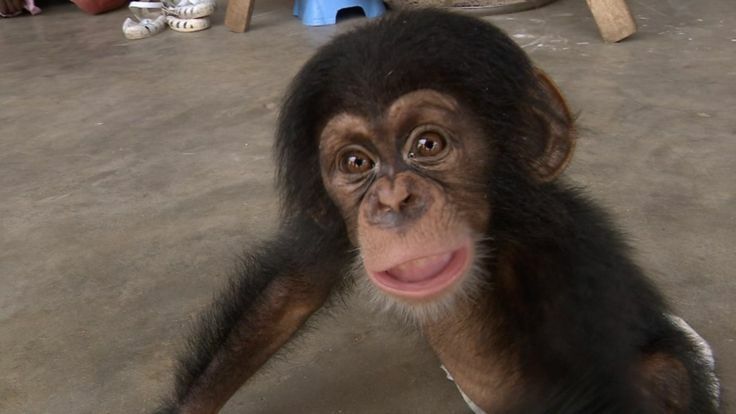 All eyes are now on the potential buyers of baby chimpanzees. China, a huge market for ivory, was persuaded to introduce a ban on it last Christmas, which could help choke off demand. The same kind of edict might help to save the chimpanzees as well.